Gosh, isn't this saying so true?? that sometimes can be challenging. We have half finished projects, schooling, chores, coloring projects and there tends to be messes every time I look around another corner. 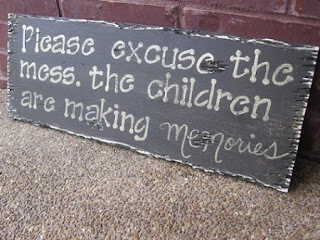 it's making memories for me, my hubby and my children. They aren't always gonna be little. They aren't always gonna want mama to read them stories. They aren't always gonna want to color pictures for the fridge. They aren't always gonna have little footprints and fingerprints on the walls. sweet treasured memories with them wherever they go. they too will create more memories with all the hidden messes. I am so very grateful for all the things my three boys have created. They sure do inspire me as a mama to do my very best each and every day. For they always look beyond the imperfections. For they are my treasures that God has blessed me with. So, please excuse the mess, while my children create the memories!! Hi Amy! Now you KNOW I love this post! I feel the same way. Your children need you now, and that's the most important thing you can do. Vacuum later! Legos now! LOL! Dear Momma of Memory Makers! You are doing the most important job in the world. Raising our Grandsons to be world changers. And so I thank you from the bottom of my heart! Lol Amy, you sure did take a load off of my burdened soul. You are right and so wise! Right now I am in the middle of a huge pile of toys I am sorting through and organizing. Trying to keep a cozy atmosphere for the boys to stay and play in.